This Pad Thai is not from Pho Haven. It is just a picture of Pad Thai, origin unknown. Pad Thai is one of my worst weaknesses. I love it. I crave it pretty much all the time. Good Pad Thai is something to celebrate and eat as often as possible. Pad Thai, by the way, is usually either Chicken or Seafood combined with spicy rice noodles, strips of tofu, bean sprouts and usually a few other vegetables. I have tried several times to make Pad Thai at home. My efforts haven't come close to the quality or deliciousness of good restaurant Pad Thai. I have given up on making it at home because others are just so good at it. A restaurant called Pho Haven opened up a while ago, specializing in Vietnamese food. Despite being a Vietnamese place, they offer pad thai on their menu. It is way closer to my house than any other good Pad Thai source that I know of. I tried their Pad Thai for the first time last week and it was outstanding, the best I've had in London. The tofu was sliced nice and thin and perfectly prepared, and the veg had a fresh crispness to it that is often lacking. Ever since I had that Pad Thai from Pho Haven, I have been a little bit obsessed about keeping my supply safe. I have not seen a lot of people eating there in the evenings, despite reading generally good online reviews for the place. Perhaps they do a great lunch or takeout business. I hope so. As we all know, making a go of it in the restaurant business is hard. I am calling on every Londoner who reads this to try Pho Haven. I'm sure most of what they make is great. It is a small, nicely decorated restaurant located near Commissioners and Wellington. It is the kind of place I would happily go on a date; tasteful but not snooty. The good people at Pho Haven have no idea that I am writing this and I have not received any consideration for this review / recommendation. My motivation for asking you to go there is completely selfish. I just don't want the supplier of my personal culinary crack to go away. PS - If anybody is in possession of a good Pad Thai recipe, pass it on. I'll think of it as insurance against a shortage. Pad Thai isn't my personal favorite, but I am definitely a fan of Thai food, and I can understand being protective of your favorite dish. 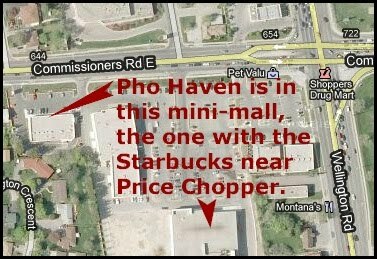 If I lived in the area, I would certainly give Pho Haven a try. Too funny. A friend of mine and I have been keeping track of all the places in Ottawa we have eaten Pad Thai. 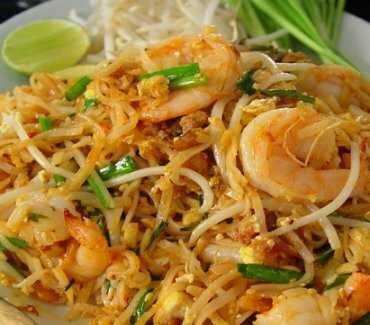 I am on the hunt of the best Pad Thai in Ottawa and have yet to find ANY that warrant mentioning. Most here don't use a peanut sauce as their base. How disappointing. I will keep you up to date just in case your travels bring you to the NRC. In any case I'll bug you for the inside line on sources if I'm headed that way... thanks! Hi, I know the exact fear you describe. It happened to us too, and the fear turned to reality as our favourite little restaurant is no more. I hope you can rally up some support and get an aft or evening crowd going. I love pad thai and I would help in a heart beat if I could.